Oooo, that sounds so ominous. Well, if not ominous, important, and actually this post is neither. But as I was re-reading and getting A MATTER OF HONOR ready for publishing as an ebook, I remembered so many things that were going through my mind as I was writing the novel. So I thought I’d share some of those secrets. First, I have to tell you about the heroine’s name. Lorane didn’t just pop into my head from nowhere. When I was a young girl, I was given a doll by bachelor friend of my parents. Yes, the bachelor part is important because he didn’t have children, so he really didn’t have any idea what an appropriate toy was for kids. He gave my sister and me dolls–dolls that go on display, not the kind you play with. These dolls had big eyes and were very stylized. My sister destroyed hers pretty quickly, but I had mine for years (even after I gave her way too much makeup with a marker). In fact my kids can remember that doll because I still had it as an adult. She fell apart about 15 years ago, but that doll was named Lorena and she lives on in my heroine. The second secret about Lorane is that she was the easiest character I have ever written. Why? Because she’s my husband. Okay, that sounds weird, but her focus-driven ways, her interest in science and her dedication to her work is as familiar to me as my own quirks because I’ve lived with them since I was married. My husband is just as focused, just as dedicated to his work, and can be just as, hmmm, shall we say unconcerned?– about the real world as Lorane can be in the novel. The only time a review has ever truly hurt me was when one reviewer said she didn’t like Lorane because she dealt with absent-minded people all the time and they drove her crazy. It hurt because my husband is such a wonderful man, so loving, so caring, but if I depended on romantic letters or gifts to show that he loved me, I’d be waiting a loooong time. Of course, I also think intelligence is the sexiest thing out there, more than abs, roses, or spewing poetry. Nerd girl here. I love Disney and our vacation to Disney World was everything we hoped it would. Our family of five was together for the first time in over a year. ANd now that political reality has intruded its ugly head into our lives (my husband is about to be furloughed if the stupid ^&#$%(* in Congress continue to not do their jobs), I’m thrilled we took the time to have this vacation. Day Three was spent at Animal Kingdom. We loved it. It was totally new to us, and fabulous. The Expedition Everest roller coaster was such a hit that three of us rode it twice. The Dinosaur ride took out two of us (upset stomachs). In my opinion, Dinosaur is just the Indiana Jones ride of Disneyland with a different theme. I made the same argument about Test Track–it’s the Disney California Adventures Cars ride with a different theme (Test Track was first). Someone back me up here. 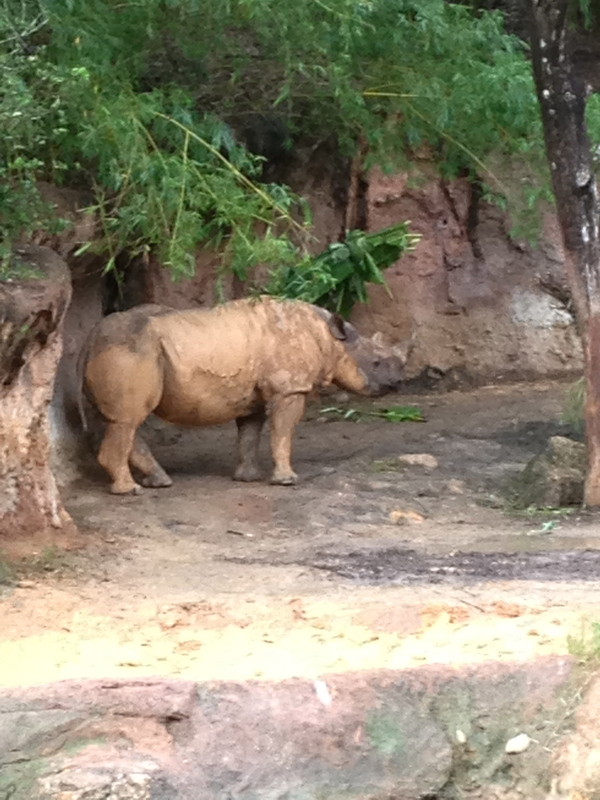 But the animals at Animal kingdom made the whole park worth while. My second favorite park in the place. That evening, after Animal Kingdom closed, we went to Epcot for dinner. We really just dashed through for food and then did a couple of rides before they closed for the night–Test Track, Nemo, and Soarin’, which I will never go on again. I was laughing the whole way through because I was scared to death. It’s the heights. I can’t take them any more. Isn’t it odd the fears we develop as we go through life. I’m not afraid of the height in a plane, but I am never climbing another tower as long as I live. And I had no issue in Tower of Terror the next day in Hollywood Studios either, but I couldn’t ride on Soarin’ without scrunching my eyes shut. My daughters were laughing at me too. It was actually quite amusing for all of us, including me. Anyway, back to Epcot. I had a chance to use my German in the German section, but only because my husband forced me to. I don’t know why I suddenly got shy. Maybe it’s because it’s ben years since I’ve had a chance to use my German. Even when I was there a couple of years ago, I spoke Hungarian with my cousins. The food in the international part was amazing. So much so that we went back on Monday night for dinner in Morocco (best shish kebab I’ve ever had). And the beer in Germany was awesome. I miss German beer. Hollywood Studios was my least favorite park. Too sunny, too hot, not enough trees, etc. We did do Star tours, which was fun because it’s different from Disneyland, and saw the shows (Meh. I’m not much one for car stunts. I’m sure it’s impressive, but I was hot and bothered.) Tower of Terror was great fun, and we stayed long enough to see Fantasmic. Sunday two daughters left to return home for work, but three of us still had two days. Morning was spent saying goodbye, and then we donned bathing suits again and went to Blizzard Beach,..just in time for the second rain storm of our stay. Still we were getting wet anyway, and rain didn’t stop us. I pushed my own limits and surprised myself at how much fun I had. I want to go back. Dinner that night was spectacular. We ate at Artist Pointe in the Wilderness Lodge. I had the best scallops I’ve ever eaten. Husband had buffalo and venison, and the honored graduate had filet mignon. And it was on the meal plan!! So except for the appletini I had, it was essentially free. (It did cost double points, but somehow we had accumulated them so it was on the meal plan.) The food and atmosphere was sublime, and the resort was impressive. Now I know where the rich folks stay. Beautiful lodgings. On our last day, we revisited Animal Kingdom because we were so taken with it. Magic Kingdom is still our favorite, but we see that a lot in California (only slight differences between the two), so Animal Kingdom it was in the morning, then back to Epcot to see the few things we missed, a few country presentations, and redo Nemo so we could explore the aquarium further. And that’s when we had RAIN. We had ponchos and decided we wouldn’t let the rain stop us, but we were soaked. What an adventure though. We went on most of the exhibits and saw most of the films, including Norway’s. No offense to Norwegians–their country is beautiful–but why is Norway a country in the international plaza? There’s no Brazil, no Egypt, no Australia, no Russia, no India, but they do have Norway. Is lutefisk such a delicacy? (I’m kidding, but my husband and I did make many jokes about it.) We buy a Santa figurine to add to our Christmas collection there. A Norwegian Santa is our Santa for 2013. And the next day was home. Too sad. I don’t even like to think about it. Our week was magical. Then it was back to reality: our remodeling has started, and then the politicians started playing idiotic games with our nation that directly impact me and my family. 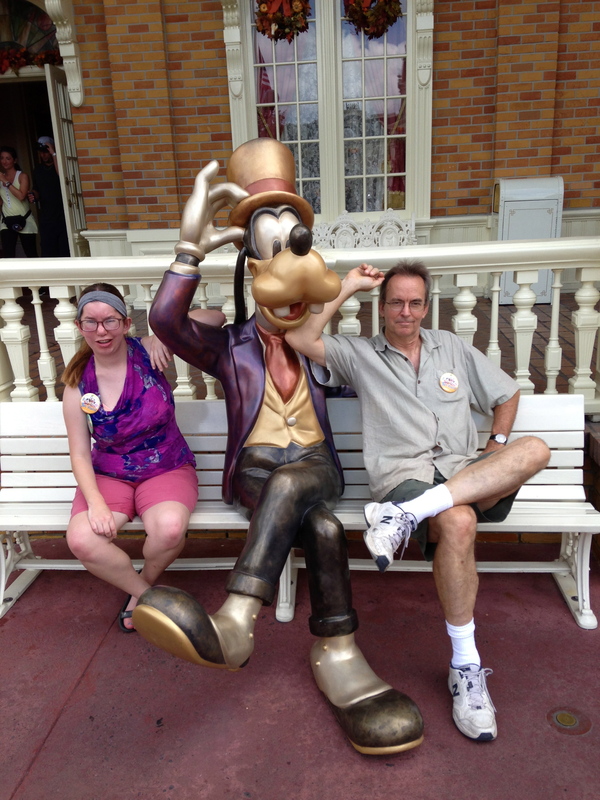 Our timing was really off on both the vacation and the remodeling–I’ll know next week if we won’t have income for a while–but I refuse to regret the week at Disney. It was worth every penny and we have so many memories to treasure.